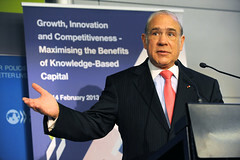 Investment and growth in OECD economies is increasingly driven by knowledge-based capital (KBC). Three types of KBC can be distinguished: computerised information (software and databases); innovative property (patents, copyrights, designs, trademarks); and economic competencies (including brand equity, firm-specific human capital, networks joining people and institutions, and organisational know-how that increases enterprise efficiency). In some OECD countries, firms now invest as much or more in KBC as they do in physical capital such as machinery, equipment and buildings. This shift reflects a variety of long-term economic and institutional transformations in OECD economies. The rise of KBC creates new challenges for policymakers, for business and for the ways in which economic activity is measured. Many policy frameworks and institutions are still best suited to a world in which physical capital drove growth. With many OECD member and partner economies experiencing sluggish growth and high unemployment, new thinking is needed to update a range of framework conditions and institutions. The OECD is completing a two-year programme of work on KBC. Senior policymakers, researchers and policy analysts will examine the policy implications of growing business investment in knowledge-based capital, as well as the key policy conclusions from the OECD’s work. Business leaders will explain how KBC is shaping their industries and business models. By reviewing state-of-the-art research and policy experiments, and by spotlighting gaps in the development of policy, this conference will help to inform future OECD policy recommendations and research. Conference participants will include policymakers from across the OECD area, representatives from non-member economies, and leading academics. High-level business leaders will also be invited to help better understand how OECD economies can harness investments in knowledge-based capital and innovation to generate sustainable growth and high-wage employment. While key research material will be conveyed through structured presentations, much of the conference will take the form of moderated Panel discussions, with extensive question and answer sessions. Each panel discussion will focus on a selection of critical policy priorities.